Joseph specializes in Swedish Massage and Remedial Massage. J. I have been giving my mum massages for a long time and she used to always say how much it relaxed her and made her feel better. I love knowing that I’m making a positive impact through my massages. 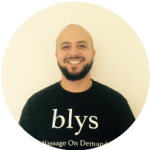 J. I feel Blys is a positive, inspiring company which is wanting to genuinely help people. J. Most definitely. I believe massage inspires wellness for customers. J. Best compliment I’ve received would have to be – I’m a blessing in disguise lol My massage helped her to be able to move around again freely. J. Favorite spot would have to be at home, with all my family niece and nephews hanging out.